Review: “Liebeslieder Walzer” at Richmond Ballet | Dance | Style Weekly - Richmond, VA local news, arts, and events. A Richmond Ballet great retires with a final, moving bow. Longtime Richmond Ballet company dancer Phillip Skaggs had the audience in tears with his final performance. A ballet dancer retiring can be likened to Icarus falling from the heavens, becoming a mere mortal once again. 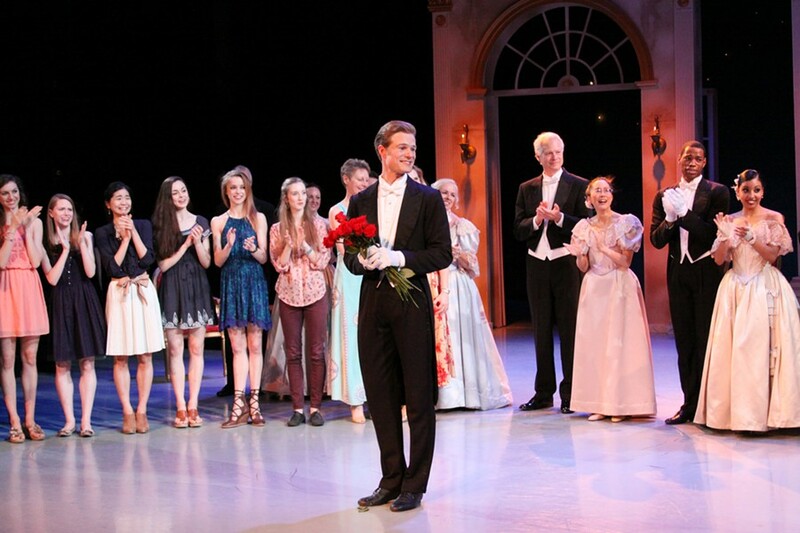 Sunday marked Richmond Ballet's final performance of Balanchine's “Liebeslieder Walzer” and a special farewell to company dancer Phillip Skaggs, retiring after 16 years. When the lights came up after the standing ovation, many were wiping tears. “I'm glad I'm not the only one,” said a fan, glancing down a row to a woman dabbing her eyes with a tissue. The elegant and intimate “Liebeslieder Walzer” allowed Skaggs to dance a role that suits him inside and out. “Phil,” Artistic Director Stoner Winslett said in her introduction, “is a true gentleman in the classic sense and to his core.” Waltzing in a tuxedo with longtime dance partner Lauren Fagone certainly drove her point home. “Liebeslieder Walzer” is about love's conflicting, powerful emotions. Technically challenging, this ballet for just four couples requires a mature dance company with eight strong principals. Richmond Ballet did not disappoint, bringing to life the original subtext of Balanchine's romantic relationships with his dancers. Watching Fagone and Skaggs partner is always a joy, made particularly poignant on Sunday by their connection and the knowledge their time together is limited. If that wasn't enough to yank tears from the audience's eyes, as part of the final bow, each company member and some of the staff at Richmond Ballet ceremoniously presented Skaggs with a red rose. Any holdouts likely caved in when his wife, former Richmond Ballet dancer Katherine Lynch Skaggs, came out with their youngest son in her arms. The older boy peeked out from the wings until Winslett herself carried him out. Skaggs scooped him up and gave him a rose as he scowled at the wildly clapping audience. Skaggs seems ready for his life as a mortal.